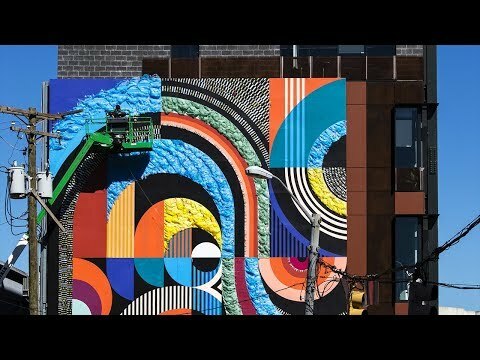 Two MICA alumni artists were recently commissioned to design and install a multi-media mural on MICA’s new Dolphin Design Center and documented the process! Designed by GWWO, the new makerspace building was constructed in the fall of 2017. Following construction, Baltimore-based artists and MICA alumni Jessie and Katey were enlisted to design the building’s west-facing, exterior mural—a prominent vantage point for onlookers and commuters. Commemorating the occasion, MICA wrote an article and filmed a video that provides a glimpse behind the scenes of the design and installation process. You can watch the video below or read the full article here. Image, video, and article courtesy of MICA.